Nothing that happens at this year’s trade deadline will change the fact that the Dodgers are underdogs to win the World Series. The Red Sox and Yankees are in a ferocious battle to win the American League East. Boston (66-30) has a chance to become the first major-league team to start a season 70-30 since the 2001 Mariners, and only needs to go 34-32 to win 100 games. Short of the Red Sox collapsing, New York (61-32) will probably need to finish with at least 105 wins to catch them. Both teams are really good. Over in the AL West, the Astros (63-34) are on pace to win 105 games themselves. Seattle (58-37) has been keeping that division race interesting, and yet by losing six of their past nine games, the Mariners have opened the door for Oakland (53-42) to creep into the wild-card race. But you’d have to imagine a nearly impossible scenario where all three teams collapsed for the AL West champions not to finish comfortably above 95 wins. And if the AL West champion then derailed the Red Sox and/or Yankees to reach the Fall Classic, you can bet that team would stand as Goliath to whoever comes out of the National League. It might seem to contradict the premise of this piece, but it’s completely valid to suggest that today the Dodgers (52-42) are the best bet to be that NL opponent. Overall in 2018, they are one of six teams within three games of the best record in the NL. Their current 50-game run of 34-16 is the best the league has seen this year. For their past 54 games — one-third of the season — they are 3 1/2 games better than any other rival. It’s easy to complain about what the Dodgers aren’t — injury-free for one, uncertain at second base and in the bullpen for another — but is worthwhile to remember what they are. Their nine position players with the most plate appearances each have above-average offensive stats, and the one who has been weighing them down the most, Logan Forsythe, has been benched. On the mound, people are concerned to various degrees with Clayton Kershaw’s back, Rich Hill’s struggles, Ross Stripling turning into a pumpkin and a bullpen that isn’t as much “lights out” as it is “lights on dimmer.” I could go on. But I don’t think many people realize that despite these and other issues, the Dodgers have the NL’s No. 2 pitching staff in wins above replacement and No. 1 in ERA and fielding-independent pitching. I saw one person Friday on Twitter call Dodger pitching “shaky,” and all I can say is — even conceding that’s true — that only means that every other team’s pitching as shakier. Earlier this week, I took a look at the team stats for Arizona — a team I consider a legit rival in the NL race to the Dodgers — and was astonished. The Diamondbacks have only five players on their entire team with above-average offense, and one of those is Zack Greinke. No one besides A.J. Pollock, David Peralta, Daniel Descalso and the inimitable Paul Goldschmidt even has an adjusted OPS over 90. On the mound, thanks in part to the unexpected injury and performance struggles of Robbie Ray, the Diamondbacks have only two healthy starting pitchers with an adjusted ERA of over 100, Greinke and Patrick Corbin. (Matt Koch, who hasn’t started a game since June 19, is at exactly 100.) You can make something of a case that the Arizona bullpen matches that of the Dodgers, but not that it is superior. None of this is to say that the Diamondbacks won’t win the NL West, or for that matter the entire league, and the Dodgers’ 10-game road trip right after the All-Star Game to fellow contenders Milwaukee, Philadelphia and Atlanta will be a lightning rod for prognosticators, but I defy you to find an organization in the league that looks more complete today than Los Angeles. 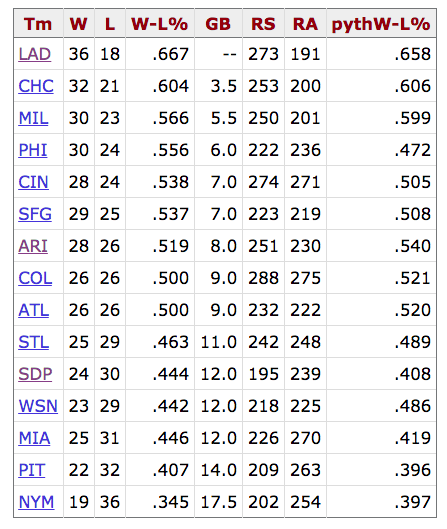 I’ll spare you an analysis of every other squad, but just to give a nod to perhaps the perceived league favorite, the Cubs, I’d point out that their No. 4 starter is swingman Mike Montgomery and their No. 5 starter is Tyler Chatwood, who has a 5.04 ERA and nearly eight walks per nine innings. Nothing personal against the injured Yu Darvish, but I don’t know if he can save that rotation. Obviously, the upcoming trade season could put a big giant rock on the scales. I’m often skeptical of how much impact trades can make, but I’m game for the Dodgers to be aggressive here. For one thing, the Dodgers don’t have a prospect along the lines of Corey Seager, Cody Bellinger or yes, Julio Urías, that I’m on my knees for them to keep. (Walker Buehler is no longer a prospect in my mind – he’s a member of the core.) They have many farmhands that I truly would like to keep — 20-year-old Dustin May leaps to mind — but in a tight, multi-team pennant race like this year’s, where one or two wins could be the difference between a real shot at a title and missing the playoffs entirely, I’d be willing to make a sacrifice. The big name is Manny Machado. On the one hand, the 26-year-old with 23 homers and a .951 OPS would be the Dodgers’ best hitter (apologies, Max Muncy) the moment he arrived. On the other, you might wonder how much the Dodgers really need him in a starting infield that already has Turner, Muncy, Bellinger and Chris Taylor. In one likely scenario, the domino effect of Machado at shortstop would push Taylor to second base, Muncy to first base and Bellinger to center field, which in turn relegates the productive platoon of Kiké Hernandez and Joc Pederson to the bench once Yasiel Puig returns. And that’s without even factoring what Andrew Toles or Alex Verdugo are capable of. Look, Machado would be welcome insurance against any more upcoming injuries or slumps, and would plainly help this team. Short of Jacob deGrom — an enormous gamechanger — finding his way off the Mets, Machado as a fixture in the batting order would be 2018’s ultimate throwdown to the rest of the NL. Perhaps most importantly, if the Dodgers got him, it would mean the Diamondbacks didn’t. But it is possible to overstate the difference he would make, and there’s no reason to suggest that if the Dodgers don’t get him, they’re not going for a title. I won’t run through the various pitching options on the market. I’ll just remind you that, as we’ve seen so many times, trades for pitching have wildly unreliable results. That said, I expect the Dodgers to make a move to beef up the pen of bulls, one that hopefully is the final move to coalesce a group that has already added the promising Dylan Floro. But back to why I started writing this. The Dodgers could make all the above moves, and I still don’t think they’d be favorites to win the World Series. The Red Sox, Yankees and Astros look like world-beaters, and don’t forget, they can also make trades. Within a week, the Dodgers could add Machado, take over the best record in the league and become the clear team to beat in the NL, and they would still be underdogs come the end of October. Whatever happens, my advice to you is to get comfortable with being an underdog. Embrace it. Nothing is likely to change it, but at the same time, the label might well underrate this team. You never know when this is going to be your year until it’s over, and worse teams have gone all the way. 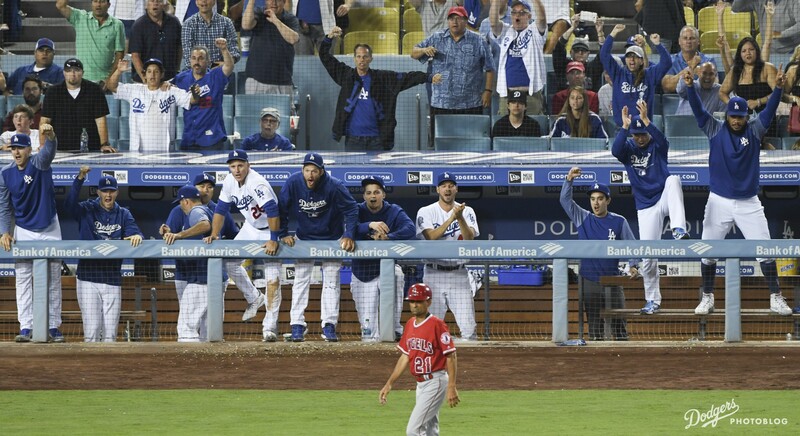 Plus, if it is the Dodgers’ year, the possibility of vanquishing either of the titans from Boston and New York, or avenging last year’s Houston heartbreaker, is so very sweet.